Meet the Derby man who has his very own Beatles bar . Beatles Radio: The Beatles, Solos, Covers, Birthdays, News The Fab 4 and More! You probably won’t meet a bigger Beatles fan in Derby - and this just goes to prove it. 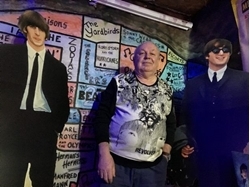 Derek Oldfield is such a big fan of the famous foursome that he has spent the past five years converting his garage to create his very own Beatles bar. The 65-year-old from Allenton firmly believes it is the best in the country. Unfortunately the bar is not open "Eight Days A Week" – not all things can be perfect but I suppose we can "Let it be". The bar is filled with hundreds of items of Beatles memorabilia any fan would love to have in their home. The Beatles are regarded as one of the best bands the world has ever seen. The band, comprising Paul McCartney, John Lennon, Ringo Starr and George Harrison, dominated the 1960s before enjoying success as solo artists in the 1970s.